I really thought that when I came down to New Mexico with my daughter's soccer team that I would have some free time to explore. I had mental images of myself photographing unusual rocks and stunning sunsets as I hiked atop a stony mesa, my thin and tanned legs clad in khaki cargo shorts and a jaunty safari hat upon my head. The reality is I'm nowhere near any kind of scenic wonder, although my daughter's soccer playing is rather awesome, and the only jaunty thing sitting upon my head is a pair of sunglasses that keep sliding down my sweaty nose. We won't talk about my legs in shorts. Suffice it to say they are neither thin nor tanned. By the way, it's a cool 95° outside. On the longest day of the year. In the desert. oh well. We can dream can't we? Hope you have a good time. I always have ideas of what my "vacations" will be like, ones that reality never lives up to. But your daughter looks awesome on the field. I wish you had more time to explore. How long is your "vacation?" 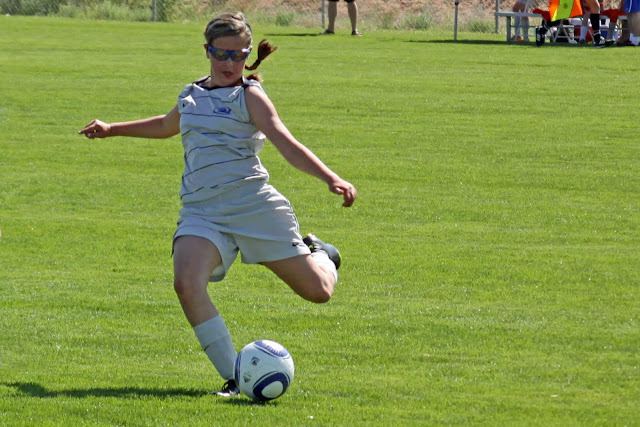 How has your daughter adjusted to playing in such extreme conditions? May I say this post made me laugh and your daughter looks like an amazing athlete. It took me a second to realize that you were being ironic when you called the temperature cool. Initially, I thought, "Wow, she acclimated fast!" My car said 103 degrees yesterday on the way home. Sounds like a great trip though. I don't do well when its that hot though...or humidity..UGH. Behold! The Power of Cheese . . .